Brice Blanc was born in France, but bent on a cosmopolitan philosophy, adheres to an old Mexican credo: Hope dies last. It has helped him weather doldrums not uncommon in the Sport of Kings, where only the minority reigns. 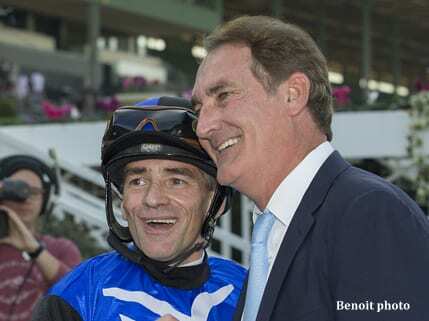 Thus it was understandable that almost to a man, Blanc's friends and cohorts rallied around him in celebration after he guided Midnight Crossing to a front-running half-length victory in Saturday's Grade III Robert J. Frankel Stakes at Santa Anita Park In Arcadia, Calif., at a $47.60 win mutuel. Blanc, who turns 45 on Jan.16, couldn't be happier to see 2017 ride off into the sunset. “I had a really rough year,” said Blanc, currently sans agent and representing himself. “I started well, and then business got really, really slow, so ending it like this and winning this race obviously means a lot to me. The last month and a half, things really picked up. “But I had such a slow and horrible summer, it was hard to keep my head up and stay focused. It's hard to keep your confidence up without riding the right horses. I mean, 99 percent of winning is due to the horse, and if you don't ride good stock it's just very hard to make it. But thanks to his unflagging resolve, Brice Blanc welcomes 2018 with newfound hope. This entry was posted in NL List, People and tagged brice blanc, midnight crossing, robert j. frankel stakes, santa anita park by Ed Golden/Santa Anita. Bookmark the permalink.